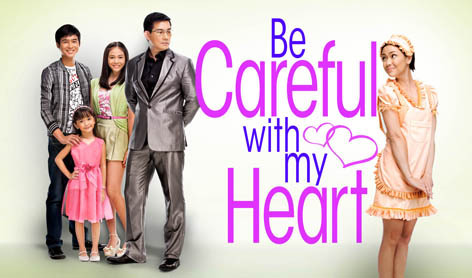 Be Careful with my Heart teleserye over ABS-CBN has redefined prime time on Philippine television. Through this show and its increasing ratings, prime time happens not only at night but is also in the morning now. This teleserye starts at 10:45 AM and is aired weekdays from Monday to Friday right after the Korean drama Two Wives and before Showtime. The storyline is simple. You can even compare it to the epic Broadway musical and movie “Sound of Music.” There is no singing though and the setting is of course at present. Here, a father becomes a widower and is always busy at work. A yaya comes into the picture that takes care of his kids. We all know that they fall in love with each other soon. In Be Careful with my Heart, the father is Ricardo “Chief” Lim and the yaya is Maya Dela Rosa who attends to the youngest of the hero’s three children, Abby who is a special child. Maya’s positive outlook will help the Chief lighten up in life, will improve his relationship with his children, and will have him fall for her. Although these are yet to happen, I’m sure it’s going to fall into place as the story progresses. All the other details including Maya’s provincial home and personal conflicts are just additional spice to the story. The complete list of cast and characters is listed below. Although the plot is simple and quite predictable, like any other love story often told, we all fall for these types of shows for the sheer “kilig” and feel good factor. In most cases, we can even relate to the heroine’s financial struggle in life and yet despite her own needs, she remains a good person who is honest and sincerely shows concern as well as love for everyone else. Jodi Sta. Maria is perfect for her role as the simple, promdi (from the) province, young, enthusiastic Maya. Richard Yap; whom people had first loved as Papa Chen is also ideal for the character her portrays. The pacing for Be Careful with my Heart is actually slow and there’s not even any hint of a developing love interest yet but the same pending status makes housewives and everyone at home glued to their T.V. screens late in the morning. The show had a good run already. And, since lots of viewers loved the characters, esp. Jodi and Richard Yap, I don't think they'd lose projects at the TV network.